Our mysterious Arabian Nights Theme transports you to a place of "flying carpets and genies". 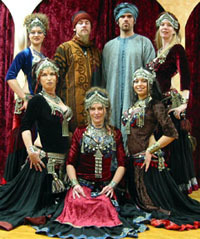 The Moroccan and mid-eastern music is set ablaze with belly dancers, which mesmerize your guests. Audience interaction comes to life with the teaching of the dance, and there can always be a camel available for a photo opportunity.